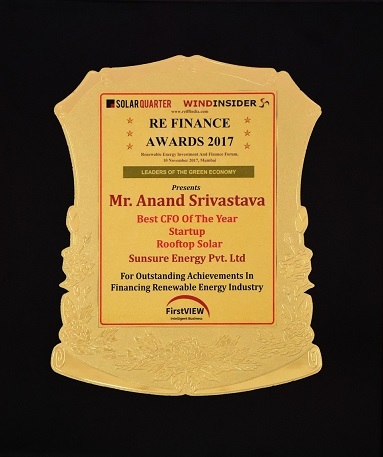 Congratulations Mr. Anand Srivastava, our Director for Corporate Finance, for winning the “Best CFO of the year" under the category Startup Rooftop Solar at the Renewable Energy Investment and Finance Forum, REIFF India 2017. REIFF recognizes leaders of the green economy every year at their forum organized by First View Group (owner of Solar Quarter and Wind Insider). Apart from Sunsure, few of the other awardees included stalwarts of the industry like L&T Finance and Cleantech Solar (under other categories). Being recognized for SunSure's achievements in multiplying shareholder returns and raising efficient capital for the last 3 years, this award is a testimony to the force that Sunsure has become in the rooftop and distributed solar space. Sunsure will continue to strive towards a green economy through a long-term solar partnership with Industrial, commercial & utility clients across India.